Planets form around a young star in this artist's concept. Credit: David A. Hardy /http://www.astroart.org. Birth of a planetary system. (a) Self-gravity collapses a slowly rotating cloud of interstellar gas and dust. 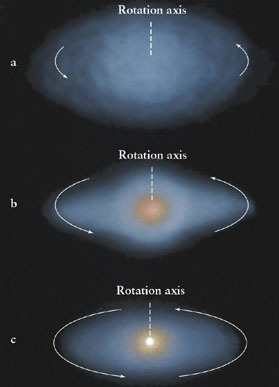 (b) The cloud flattens and rotates faster around a newly formed protostar. (3) The young star begins to shine surrounded by a flattened disk out of which planets will eventually form. A consensus theory of planetary formation is now to hand based on the nebular hypothesis. It envisages the gradual accretion of planets, moons, and smaller objects, from cosmic dust grains and gas particles within a primarily gaseous protoplanetary disk, which is itself a by-product of the formation of the parent star from a dense, rotating interstellar cloud. Calculations suggest that dust grains will grow by "sticky" collisions into planetesimals of the order of 10 km across (although there are still theoretical difficulties with the later stages of this process). 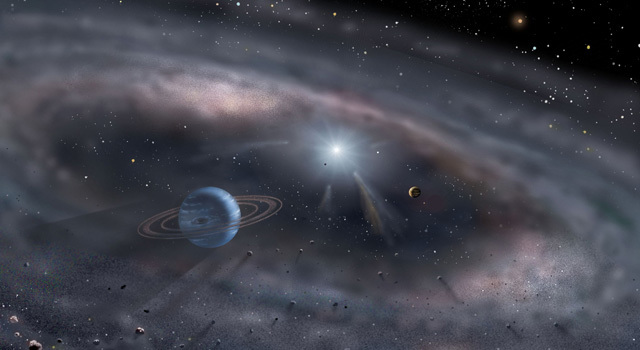 These planetesimals then begin to interact with each other through gravity leading to a phase of runaway accretion and rapid growth.2 Confidence in this theory has been boosted by the discovery and study of numerous circumstellar disks, with masses in the range 0.01 to 0.1 solar mass, needed to produce a planetary system like that of the Sun, around young stars of widely differing spectral type. However, the theory has only been investigated in a narrow range of initial conditions and still has little predictive capability. This fact was illustrated by the unexpected discovery of massive planets in very small circular orbits (see epistellar Jovians) around Sun-like stars. The solar system, it is thought, began as a subcondensation (see globule) in an interstellar cloud of gas and dust, from which probably hundreds of other stars also formed. To begin with, this presolar cloud was spheroidal, slowly rotating, and quite large, with a diameter of perhaps one or two light-years. As it condensed, its rotation rate increased (as a result of the law of conservation of angular momentum), causing it to become increasingly flattened. In the middle of the disk, where the density was greatest, the protosun began its final condensation. By the time the Sun had initiated nuclear fusion reactions in its core (see T Tauri stars), the pancake-shaped protoplanetary disk had started to form agglomerations at various distances from the center. Two key factors determine what kind of planet a protoplanet will become: its mass and its distance from the central star. Planets of low mass cannot retain hydrogen and helium, the lightest and most abundant gases, especially if their temperature rises to the point at which the lightest molecules escape. When the planets were in their early accretional phase, the mass that agglomerated before the Sun began to shine helped determine how well the planet could retain its hydrogen and helium. The other crucial factor, the distance of the planet from the Sun, also influenced the escape of hydrogen and helium from the planet's gravity, because inner planets become hotter and so have more difficulty in retaining the lightest gases with a given amount of gravitational force. These considerations explain well the overall structure of the solar system. The four small, inner planets were unable to hold on to any free hydrogen and helium with which they may have started out. However, the four gas giants, lying much further out from the Sun and therefore having much lower temperatures, not only retained their light gases but, through their powerful gravitational pulls, continued to draw in more material after the Sun had turned on. 1. Tel Haar, D., and Cameron, A. G. W. "Historical Review of Theories of the Origin of the Solar System." In Robert Jastrow and A. G. W. Cameron, eds., Origin of the Solar System, Proceedings of a Conference Held at the Goddard Institute for Space Studies, New York, January 23-24, 1962. New York: Academic Press (1963). 2. Lin, D. N. C., Laughlin, G., Bodenheimer, P., and Rozyczka, M. "The Formation of Substellar Objects Induced by the Collision of Protostellar Disks," Science, 281, 2085 (1998). 3. Lissauer, J. J. "Planet Formation," Annual Review of Astronomy and Astrophysics, 31, 129 (1993).